last summer, my friend kristen sent me her favourite recipe for granola bars. i know- those of you reading this you are probably thinking one of two things. 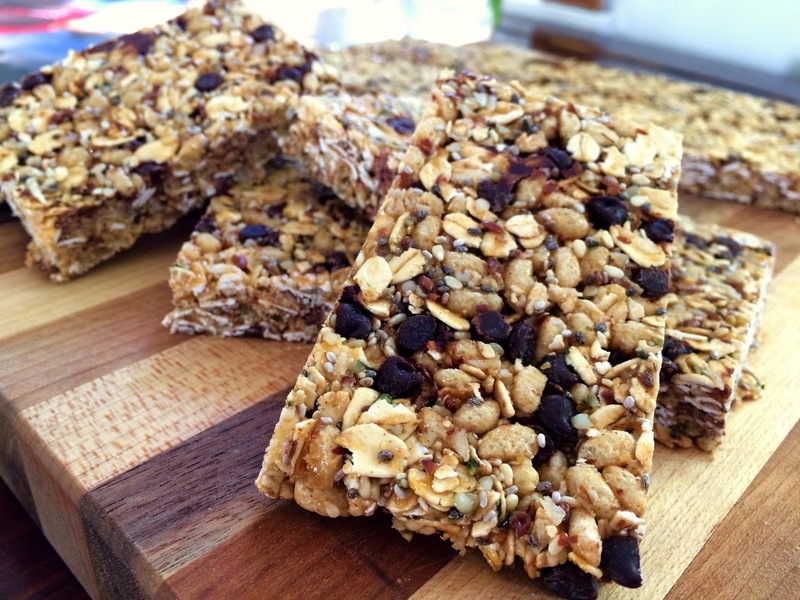 either 'meh- granola bars. take it or leave it.' 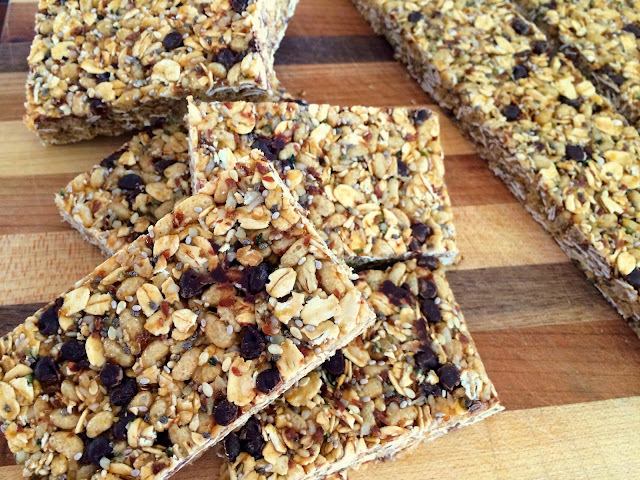 or 'meh- granola bars. full of sugar masquerading as a 'healthy snack''. it took me some time before i actually got around to making these- mostly because the ingredient list is a lengthy one, so procuring everything (and then instructing the other members of my household NOT to add everything to their smoothies!) was a continual work in progress, but once i finally made them, it was like our entire world changed. these are seriously delicious! i most recently made a batch for finn to take to school to share with his classmates on his birthday, and everyone LOVED them! (and his teacher was appreciative of the no-sugar factor). small note- i always double the recipe because 1) they will get eaten. quickly, and 2) a doubled recipe fits into a large baking sheet just perfectly. enjoy! in a large bowl, mix together oats, crisp rice, hemp seeds, ground flax, coconut, sesame seeds, chia seeds, cinnamon, and salt. in small saucepan, stir brown rice syrup and nut/seed butter together. cook over medium heat until mixture softens and bubbles around edges. remove from heat and stir in vanilla. pour nut butter mixture over oat mixture, using a spatula to scrape every last drip of it out of the pot. stir together well with large metal spoon until all of the oat mixture is coated in nut butter mixture. transfer mixture to prepared pan and spread it out evenly. using spatula, press down the mixture firmly to compact. the harder you press and more evenly you spread the mixture and the better the bars hold together. you can use your fingers dipped in cold water to help press down the edges OR if you are using a baking sheet, a rolling pin (or large glass jar used as a rolling pin) spreads and compacts the mixture so perfectly! place dish or tray in the freezer and chill for 10 -15 minutes, until firm. or if you have more time on your hands, you can put them in the fridge and cut them whenever you are ready. using the parchment paper as handles, lift the mixture out of the pan and place on cutting board. slice into 5 or 6 rows using pizza roller or large knife, and then slice them in half or thirds for desired bar size.